The frost thaws, and once frozen ground has transformed itself into a mess of grass, mud and puddles. Slowly, new shoots appear from the earth and sprout buds. As they open, a few sleepy eyes peer out. Gossamer wings glitter in the morning sun. The creatures take flight, and herald the dawn of the new spring. New art and stories have been posted. John Beechem has created a short story about a young man in the throes of madness. See the world through the eyes of the moonstruck in "Delusions of Grandeur". Selena McCracken has penned a tale of love and death in "The Science of Fate". A research-driven, grave-robbing doctor meets a reluctant teenage prostitute on the streets of Victorian London. This bitter-sweet love story features an unlikely couple in a grim setting, discovering much about themselves and each other. Artist Jodie Beechem has added two water-color paintings, quite different in style but sharing an excellent use of color and the medium. She has also posted her first collage, "Get Crunched Up" combining a keen sense of geometry with a rush of explosive energy. so whether you're a gargoyle or a fairy at heart, there's bound to be something for you. American Fantastic is also excited to introduce its audience to Seattle artist Krista Wade. Krista creates in a variety of mediums including ink, acryllic, soapstone sculpting, and is even learning video game design. Check her out! For submissions, please e-mail americanfantastic@gmail.com with your content included as an attachment. After a six month hiatus, new content has been added to American Fantastic. We are extremely pleased to post new material, and hope to continue to update more regularly through the savage heat of summer, the sun's fire lighting the flame of our muses. John Beechem has posted chapter 15 of his on-going fantasy novel, The Chronicles of Trivo: Phoenix Ranger. In the latest installment, Trivo and his allies enter the Drulag Caverns, home to the deepest, darkest evils in the realm. In an uneasy alliance, the companions join warriors of the local tribe, the Kel ta Ko and a clan of vampyrs who call the caverns their home. Together, they battle a horde of the undead under the control of a necromancer's apprentice, in a fight for the future of their homelands. Dordji has added three new pictures of speculative evolutionary art about a world in which life has evolved on a hostile planet filled with toxic gas and seas of acid. Dordji specializes in drawing fantastic creatures whose anatomies are based on a blend of biology and imagination. Thank you for returning to American Fantastic. American Fantastic continues to grow like the majestic horn of a newborn unicorn or the all-consuming darkness of a black hole, depending on your sensibilities. The insane architects of this website would especially like to thank those contributors who have made this update possible. Dordji has updated his gallery to include some black and white pencil sketches that feature dark creatures only his twisted imagination could fathom. Jodie Beechem has added three new pictures to her gallery, including abstract pieces that combine elements of geometry and abstract symbology. Gary Boyd has shared two of his literary oddities, "A Tanae Solium". The prior is a short story about a man infected with an intelligent tapeworm, and the absurd world that they inhabit. The latter is about a fabricated person named Ayeen and the room that he inhabits. Last but not least, John Beechem has posted two recent chapters to his swords and sorcery epic, The Chronicles of Trivo: Phoenix Ranger . Follow Trivo and his companions as they journey through the foggy foothills of the southern highlands, battle a cave dwelling cyclops, and combine forces with a blood sucking vampyr against the evil necromancer, Count Benedict. A special thanks to our contributors this week. This is the largest update we've had since the site's creation, and this makes American Fantastic a truly collaborative effort. Remember, we crave new content like a zombie hungers for human flesh, so please submit any original works you would like to see posted to americanfantastic@gmail.com. Thank you for visiting, and please enjoy your time in this realm of wonder and darkness. Gary Boyd has written a short story called "Spiegelgrund" told from multiple perspectives about heartbreak and its aftermath. His characters are as flawed as his writing is not, and he has provided us with a compelling read. Jodie Beechem's art gallery has been expanded to include a few new pictures of black and white art she has created including a sea gull drawn in the style of a Native American woodcarving, a pair of spectacles, and some rootin' tootin' boots and spurs. A young artist draws in the style of the ancients. John Beechem has posted a poem about the beauty and darkness in his neighborhood in Seattle, WA titled "Aurora". Thank you for visiting American Fantastic, and remember, we love those who submit writing and/or art to americanfantastic@gmail.com. A modest update adds to the menagerie of works by artist Jodie Beechem and writer and site co-creator John Beechem. Jodie continues the tradition of humor, strageness, and surreal beauty of her gallery while adding new works that involve eye-popping color and a black sketch pad. John has posted the first part of a work of urban fantasy about a young woman named Lynlea, balancing her life as a stressed out teenage hipster scholar with her fight against dark supernatural forces intent on using her "gift" for evil. It's called The Hat Man's Shadow and it takes place in the same darkly fantastic Seattle as John's previous urban fantasy short story Scorch. Lynlea, is the daughter of Ryu Murikami, a homicide detective who is not constrained by conventional notions of possibility. Hello, fantaseekers, sci fi-nauts, fictioneers, and gazers into the abyss. Author Jeremy Garrett has posted a piece of flash fiction about people living through the aftermath of the Christian Rapture, titled Scenes from the Rapture. Dordji has posted some new art, an illustration of a creature from John's story, The Chronicles of Trivo: Phoenix Ranger. This creature, a terraphaunt, stalks the burning plains. 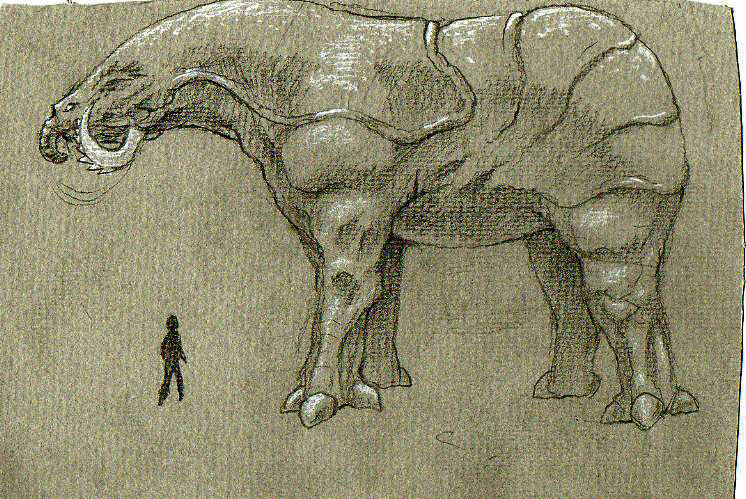 The figure underneath provides some helpful scale (the saw-toothed tusks are for ingesting dead and withered trees). John Beechem has posted new chapters to The Chronicles of Trivo: Phoenix Ranger. Read the latest entries here, or go back to the beginning to catch up. Thank you for coming, and do mind the terraphaunts; their terrific rumbling has been known to rattle bones. First is a series of unique pencil sketches by Eugene, OR artist Jodie Beechem. Jodie has a surreal, humorous style, and has promised to create more art for the site. Our second new artist is Mike Maes, an illustrator from Louisville, KY. Mike designed a graffiti style colored pencil illustration that we hope is his first of many contributions. American Fantastic has a new look. There is also a lot of new content on the site. "Illegal Aliens" is a recently posted science fiction short story by site co-creator John Beechem. 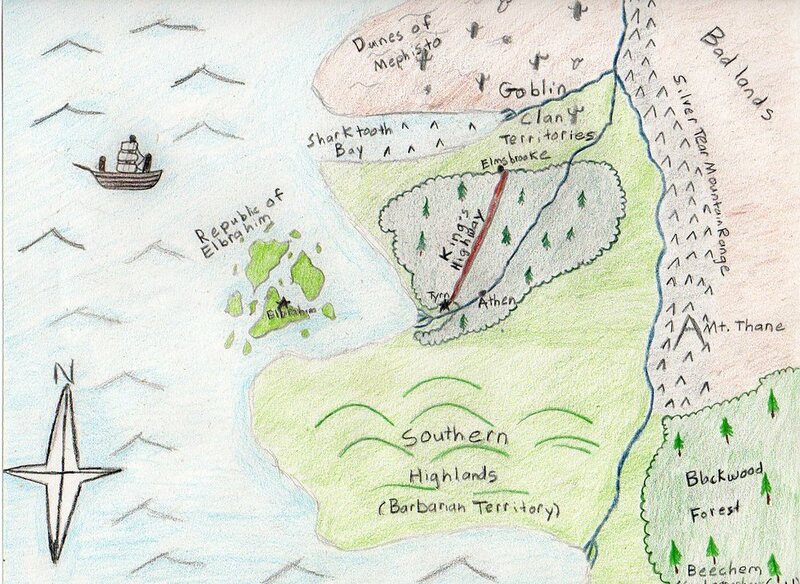 John has also continued to post updates to his fantasy story, The Chronicles of Trivo: Phoenix Ranger, including a colored map of Tyrn and its surrounding countries. Continue checking for new chapters of this story and for new stories by John and other writers. Jo'n Beachum is only an apprentice member of Tyrn's cartographer's guild. Dordji (co-creator) has added a new banner, a new background and continues to post his art work on the site. See his work in "Dordji's website elements" from the link just below the banner. Keep an eye out for new art from Dordji and other artists. We are always looking for new content and contributors to the site. Please submit original artwork and writing to americanfantastic@gmail.com. I recently finished the title banner, as well as a few background pictures. I'm going for a feel of energy and imagination, but with a pleasing overall color scheme. I'll put all my finished stuff on the site so folk can take a gander. Words of critique would be appreciated. This website is still gestating. Check back regularly to see future stages of development.